Bianca Coventry with some of her cupcakes. Ms Coventry’s father was diagnosed with CF over 13 years ago at the age of 50, which was considered a miracle by his family because most people living with the illness do not live past 40. This year, the mother of one, decided to get involved with CF awareness month during May, also known as 65 Roses Month. The 65 Roses Month challenge encourages people to get involved in fundraisers or events with the theme of 65. Ms Coventry will bake more than 250 vanilla and red velvet cupcakes throughout the month. Ms Coventry does all her baking on Fridays and delivers the cupcakes on Saturdays. 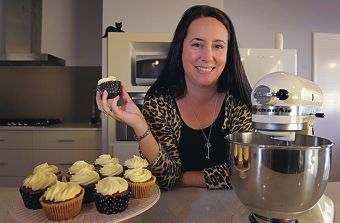 If you would like to help her, you can purchase the cupcakes by contacting thecoco_bean @yahoo.com.au.